Over the last 10 years, shares of Cisco Systems (CSCO) are down over 60%. But that's not because the company has been eroding shareholder value. 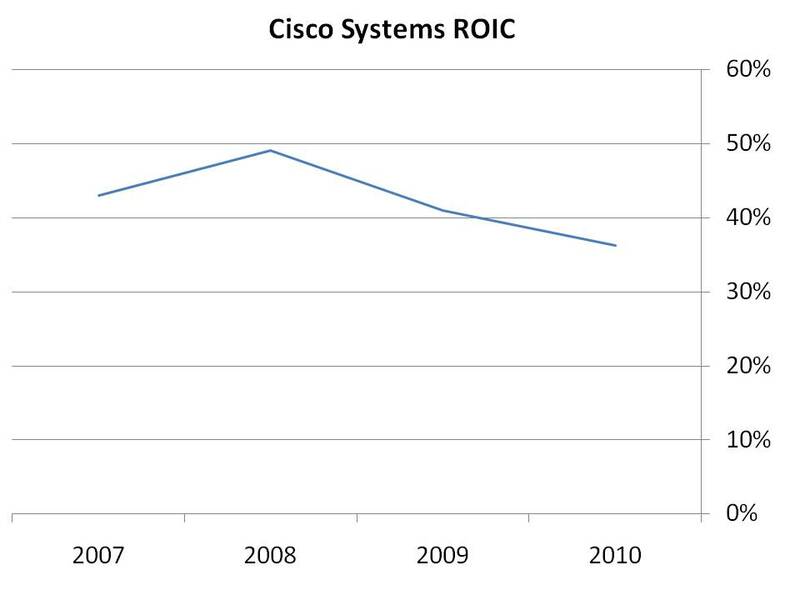 Cisco earned $1.33 per diluted share in 2010, whereas it earned 36 cents per share in the year 2000. Yet the stock fell over this 10-year period because it had a P/E of 140 back then; today, Cisco has a P/E (adjusted for its net cash position) of just 10. Before panicking at the apparent downtrend, consider that 1) the absolute numbers are still high, and 2) numbers will be weaker during a recession. 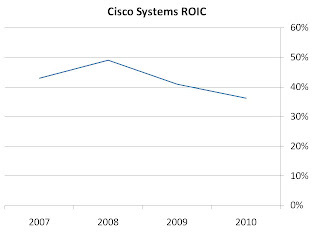 These high returns do suggest that Cisco has a moat. Further analysis of the company's core products reveals that Cisco dominates several product lines, in some cases delivering market share numbers north of 70% and even 80%. These kinds of numbers will help Cisco maintain and grow its moat, as it is able to spread R&D spend over a much larger number of units than are its competitors. Sometimes, companies will also trade at low P/E's because a company's industry is in secular decline (e.g. the newspaper industry). This, too, is hardly the case for Cisco. In fact, it may be just the opposite. Networking needs continue to grow worldwide as populations continue to seek higher and higher bandwidth connectivity for a multitude of devices. Cisco is at the forefront of the network hardware architectures required to make this happen. Finally, companies also trade at low P/E's because of negative short-term sentiment. That appears to be what's happening here. The company's latest quarterly guidance was below estimates, as Cisco expects just 3-5% year-over-year revenue growth next quarter due in part to government budget cuts, as state and local governments look to bring their fiscal houses in order. This caused the stock to fall some 20% over the last two weeks. But annual revenue growth is still expected to come in between 9 and 12%, suggesting the business is still sound, growing and undeserving of such a low P/E. "If you look at what we do, we always purchase the stock during periods when we see it sliding a little bit." When a company with a sustainable and proven competitive advantage trades at a low P/E, opportunity knocks. Investors with an eye for the long term are likely to do well going long in such situations. You can say the same thing about Microsoft, and it's even cheaper. High ROIC, ROE coupled with low EV/Free Cash Flow and low investor sentiment make good risk reward bets. Yes I agree with you here. You might also find Microsoft interesting. Unloved (low PE), great balance sheet, tremendous long term growth historically. Thanks for the idea. I do not know much about CSCO but from reading various news sources casually I learn that the company issues considerable amount of stock options to execs and employees. How does the company share buyback compare against stock issuances due to ESOP? i don't find such large-cap companies which are the core of the wall-street back and forth to provide much in the way of value to a retail investor. there are far too many preferable investments in the mid-cap/small-cap world which are better suited to the goals of any retail investor than companies like Microsoft and Cisco. You guys beat me to the punch; tomorrow's post is about Microsoft. First, it's important to note that options are expensed, so they reduce the profit numbers quoted already. Second, in the notes to the financials, you can see all the options outstanding, and subtract their value from your valuation of the company. To directly answer your question though, you just have to look at how many shares Cisco has now versus a few years ago (depending on whatever time period you choose). There are currently 5.54B shares outstanding, whereas in 2005 there were 6.33B. Returning equity via dividends is much more shareholder friendly. The buybacks prop up the share prices giving a disproportionate benefit for employee share options. One issue that seems to come up relates to vendor financing (i.e., CSCO inflating sales numbers by financing those sales to customers). This was a big issue during the dot-com years. I'm not sure how to track down the info, however. Was it an issue for you? There's a lot of issues at stake between dividends and buybacks. On the other hand, dividends are usually taxed to the investor, so buybacks are more tax-friendly. You are right, revenue recognition has been brought up about this company before. But it seems to be a small part of their overall revenue. Anymore, more on that here. Thanks for the excellent post, as always. Which gives you a ROIC of ~15%, which is still pretty nice, but not the 30% number you have in your chart. Note the formula I use (stated in the last line of the post). I think the main difference between our calculations is that I am not including cash as part of the "invested capital". did you adjust roic for low (-> unsustainable) tax rate? I agree. I am long on CSCO since last fall myself. The price is even lower at the time, which offers a continued opportunity in my opinion. I'm a "IT Architect", and enjoy investing as a hobby. For Value Investors, tech companies can be difficult to valuate & many have offerings that can easily be replicated & improved (e.g. does anyone remember GeoCities, Netscape, Palm, AOL, Gateway, Nortel, etc...). Cisco; however, jumps out to me as a business with a durable competitive advantage. They truly run the "backbone of the Internet" & no one even comes close to providing competition in the networking world. Now they are poised to take advantage of the inevitable adoption of Cloud computing & for the first time, they have entered the server space, released an impressive lineup that is (IMO) going to take away significant market share in the server space away from IBM, HP, & DELL. As you guys have already mentioned, the ratios & price look good. As a techie, I'm not as high on MSFT, because virtualization & Cloud are going to make it easy for enterprises to easily switch to alternate operating systems (e.g. MacOS, Google, Linux), mail systems (e.g. Google Apps, Amazon EC2), & cloud will render a ton of MSFT's supporting applications irrelevant.